"Points To Keep In Mind While Writing Product Description For E-commerce"
"How Businesses Can Benefit From AR And SEO"
There are who already would have heard about open source software. Now, for all those who do not know what open source software is, an open source software is one which has a source code that is freely available to everyone; anyone interested can easily inspect and modify this code. Its easy accessibility has made it quite popular in the IT world. Open source software has now even found their way into testing. Today there are open source testing software that assists with testing; one of the critical operations carried out in an IT firm before the promised deliverable is passed over to the client. It is true that the open source testing software has now made testing more easier. Along with the advantages, it also has some disadvantages associated with it. Let's have a look at its main advantages and disadvantages. When it comes to testing software, there are two types of testing techniques; manual testing and automated testing. Automated testing requires specific software to be used. Now, many companies purchase this software or get it developed by paying another company. What if, this software was available for free? That’s open source testing software. Unlike other software, you don’t need to worry about installing them or even about the license issues. Since it is open source software, you have the entire software code. Modify it to fit your system! It is not always necessary that you think about every functionality you are going to need them during a software purchase. So when a sudden requirement for certain functionality arises, you will have to wait around for the vendor to make them. In case of an open source testing software, you have no such restrictions. The open source software codes are developed and updated by programmers who are simply passionate about coding. What if they suddenly lose this interest or got pre-occupied by some other tasks? There would be a sudden halt in software development; which means no more updates. For testing, where you depend on this open source software, updates are highly important. The code for your open source testing software is available for all for free to all. What if, someone, just another developer, thought of finding out the weak points in the code and then modified the code to exploit that weakness? It is a possibility you cannot rule out. 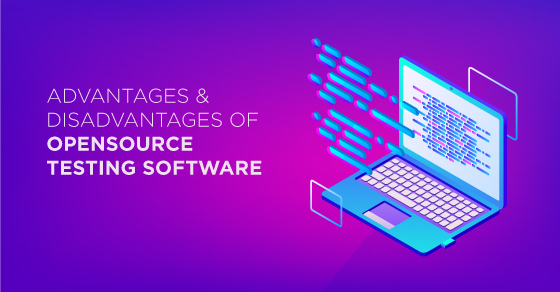 While there are certain disadvantages associated with an open source testing software, these are very often forgotten over its advantages. Most organizations that deploy open source testing software have a team that does checks and works on the software's security aspect.